LTHOUGH it is pretty certain that the Danes, at a very early period, encompassed several of the cities and towns which they held in Ireland with walls and towers, their works have long disappeared, and, though the walls and gates of several of our ancient cities remain, they are obviously of comparatively late date, and are invariably found in connexion with places which we know to have been anciently strongholds of the English. Occasionally, as at Drogheda and at Athlone, the wall is of considerable height and thickness. That of Wexford, of which a large portion remains, is strengthened with semicircular towers, but they are usually plain. It is extremely probable that the great majority of these works, at present remaining in Ireland, were spared, simply because, since the general application of gunpowder to the purposes of a siege, they could no longer be relied upon as fortifications. 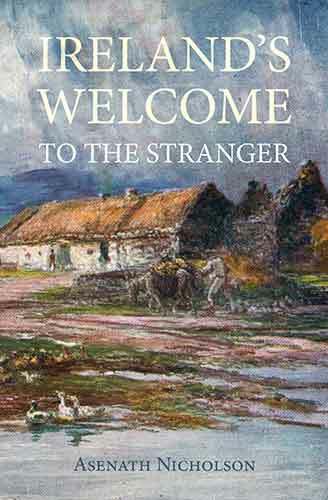 This much is certain, that the walls of all the Irish cities and towns, which were anciently remarkable for strength, and the security they afforded to the besieged, have been almost entirely destroyed. 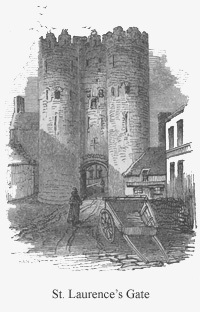 Several gates and towers, however, remain, and of these the finest in the country may be seen at Drogheda. Saint Laurence's Gate, the subject of the annexed illustration, consists of two lofty circular towers, connected together by a wall, in the lower portion of which an archway is placed. 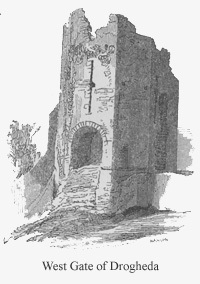 The towers, as well as the wall by which they are connected, are pierced with numerous loop-holes; and it is probable that the latter was anciently, upon the town-side, divided into stages by platforms of timber, extending from tower to tower, otherwise the loop-holes could not have been used by the defenders of the gate, and we know that, even in their most beautiful buildings, the ancient architects rarely added an unnecessary feature. The other remaining gate-tower of Drogheda is octangular in form, defended with long narrow loop-holes, wider in the centre than in the other parts, and was further strengthened by a portcullis, the groove for which remains nearly perfect. The greater number of gate-towers remaining in Ireland are square, and of considerable height. Their archways are generally semicircular, but there is a beautiful pointed example at Ross, in the county of Wexford. Since the period of Cromwell's "crowning mercy," the successful storming of Drogheda, the walls have been gradually sinking into utter ruin, but, from the portions which yet remain in a tolerably perfect state, an idea may be formed of their ancient strength and grandeur. 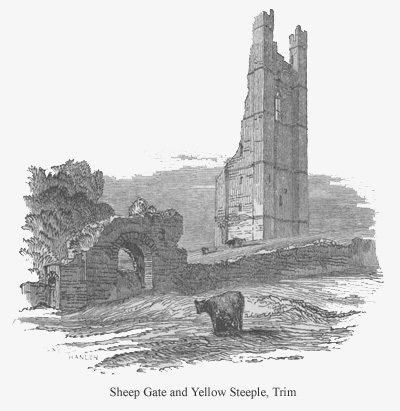 We shall conclude this notice by presenting our readers with a view of the Sheep-Gate of Trim. The lofty tower in the distance, the steeple of St. Mary's Abbey,* is of a late period of Gothic architecture. * Mr. Butler, in his book on the Castle of Trim, remarks that in 1449-50, Richard, Duke of York, held his court there; that he was a benefactor to Saint Mary's Abbey; and that the Yellow Steeple may probably be assigned to his time.